It was a brilliantly sunny day in London last Saturday, the sort of brilliant day only London has. High blue skies, full of jets and jet streams, a wonderfully sharp, crisp yellow light that flooded through the High Street darting in and out of the shop windows, lifting the step of Saturday morning shoppers, tickling the ruddy red cheeks of people clad in winter hats, scarves, and prompting smiles of greeting and laughter. Sunday was completely different. It was grey, studded with black figures scurrying around, dark and stilted. The buildings were sombre and bore down on the day. The bare trees were menacing and the traffic growled and groaned. That is London for you. Yes, I was in London visiting my mother last weekend. It was her 88th birthday. It is interesting but slightly scary to watch your mother evolve into a fragile bird like creature, tiny, bobbing head, crooked step with claws for hands that gesticulate horror and fear at finding herself so. A creature with skin so delicate and transparent you can see its inner workings. Anxieties and distress leak from its pores. She is like a hunched root of power and anger brimming with indignation and frustration, sitting in a blue chair. However, the birthday event was charming. It was the first celebration that has gone well in the family for many years. When we go out, she usually can’t hear, can’t smoke, gets irritated, is uncomfortable and insists on leaving half way through the meal, muttering with fury. So the brother insisted we stay in and he would make a meal of her choice in the safety of the house. She chose a menu of Sorrel soup, paté fois grás, fillet steak with homemade chips and coffee éclair with crème pattissiére. My brother went to much trouble to source, prepare and cook. She was able to smoke between courses and we were all able to shout so she could hear and she could be as rude as she wanted without embarrassing anybody, and of course, it went very well. A great success! But families, well they are distressing, aren’t they? In spite of being a well matured woman of 57 who has successfully settled in another country, developed a flourishing career, managed her own business, raised two fabulous children, been an active participant in her local community and even got a book of poetry published, it seems that when she is in the breast of her London family she becomes a quivering wreck of nerves and fears, anxious to please…a blubbering child! 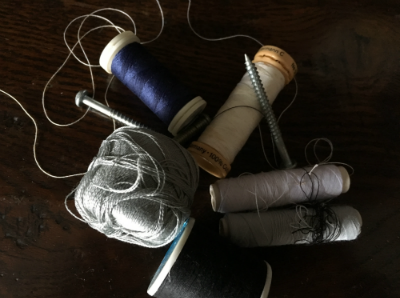 Over the weekend I was also reading Ann Tyler’s A Spool of Blue Thread. It was unfortunate really, as it threw into sharp relief our own familial dysfunctions. If you are into family dynamics, A Spool is for you. Ann Tyler is a master at portraying the tensions between family members, drawing out their niggling habits and characteristics until breaking point, just like in real life. The story is written out of sequence which works well. At the appropriate moment in life, she shoots the story of the family member into the puzzle which is actually how life works, isn’t it? It is only when I go back into my family from my o life that I can see (if not understand) a little more of my origins. I quite like Ann Tyler, but I could have done without reading it when I was spending time in London. Finally, I popped down to see the David Bowie memorial in Brixton. Personally, I would no more lay a bunch of flowers, or a symbol of my heart on a wet South London pavement in tribute than apply for the next British or NASA space expedition but I am truly glad others do. Not only was there was a wonderful explosion of colourful carnations, tulips, roses, freesias, lilies, geraniums, irises, pictures, and personal messages beneath the mosaic of David Bowie, but also objects of significance: amongst others two perfect, red dancing shoes and a grinning goblin (I didn’t get the meaning of him). How lucky I am to be able to be supercilious about sentiment and hypocritical enough to draw pleasure from the sentimentality of others, for I too loved David Bowie. He was almost a member of our family, but luckily for him, not quite.